Attitudes toward immigration policy are driven by fears about cultural diversity, not just individual economic circumstances. This column looks back at the Age of Mass Migration (1850-1913), when 30 million migrants moved from Europe to the US, to examine whether such fears are justified. US Census data from 1920 reveals that recent immigrants gave their children more foreign names than long-standing immigrants, which suggests that cultural assimilation did take place over time. This assimilation had economic benefits for children, both in school and in the labour market. The resonance of Trump’s anti-immigrant message is consistent with survey evidence demonstrating that voters’ attitudes toward immigration policy are driven by their fears about cultural diversity, rather than just by their individual economic circumstances and whether they stand to gain or lose economically from in-migration (Citrin et al. 1997, Hainmueller and Hiscox 2007). Despite the centrality of these concerns to voters’ preferences, there is little empirical evidence about the extent and speed at which different immigrant groups culturally assimilate into US society. In the past, new immigrants arrived from Southern and Eastern Europe, joining earlier waves of migrants from Britain, Germany and Ireland. Today, many immigrants hail from Latin America and Asia, entering a country that is already more diverse. Are fears that immigrants retain their own cultural practices and fail to fully join American society justified by the data? By this measure, we find that recent immigrants gave their children more foreign names than did long-standing immigrants, which we take to be evidence of cultural assimilation with time spent in the US. Figure 1 graphs the distribution of name foreignness in 1920 for the children of native-born parents, and for the children of foreign-born parents who had been in the US less than/more than 10 years. The distribution of names bestowed by native parents is shifted to the left, dropping off substantially after an index value of 60. Among foreign-born parents, recent immigrants were far more apt to give names with an index value above 60 than were long-standing immigrants. 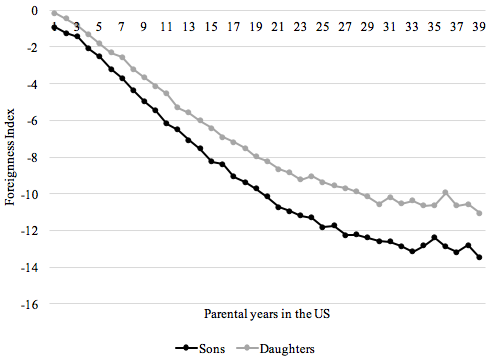 Figure 2 presents estimates of the effect of parental years in the US on child’s F-index, generated by comparing siblings born after their parents spent more/less time in the US. The figure suggests that immigrant parents would erase half of the gap in name choice with natives after 20 years in the US. Notes: Sample includes non-black children born in the US (outside of the South), living with their parents, and between the ages of 0-18 in the 1920 Census. Households are classified as native- or foreign-born based on the place of birth of the household head. 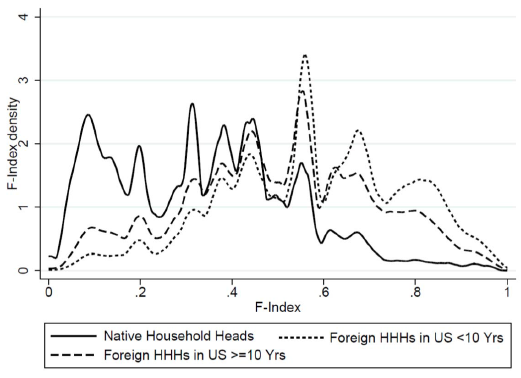 Foreign-born households are further divided by time spent in the US (more/less than 10 years). Notes: The graph reports coefficients from a regression of the F-index on a set of dummy variables for years that the household head had spent in the US by the time of the child’s birth. Regressions also include dummy variables for child’s age and a set of household fixed effects. Data from 1920 complete-count Census. Sample includes children aged 0-18 who were born in a non-southern state and are living with their parents. Households must have a foreign-born head and the spouse (mother) must be less than 43 years old (N (sons) = 2,130,352; N (daughters) = 2,081,724). Some immigrants may arrive with a strong desire to assimilate, but with little knowledge about how to effectively do so (in this context: little understanding of which names are popular among US natives), while others may start out with a strong cultural identity that may lessen over time. We interpret the shift away from foreign names with time spent in the US as driven by some combination of learning about US culture, acquiring a greater desire to integrate into US society, and deciding to stay in the US (rather than return to the home country). Name-based assimilation occurred at the same rate regardless of household literacy or wealth (as proxied by homeownership). Yet the speed of assimilation varied substantially by country of origin. Immigrants from Scandinavian countries (Denmark, Norway, Sweden) had among the fastest rates of cultural assimilation, followed by immigrants from Southern Europe (Italy, Portugal). Russian immigrants (many of whom were Russian Jews) and Finns had the slowest rates of name-based assimilation. Because their names were similar to US natives to begin with, immigrants from English-speaking countries (England, Scotland, Wales) exhibit no changes in name choice with time spent in the US. Cultural assimilation had economic benefits for children, both in school and in the labour market, in the early 20th century. We link over a million children of immigrants across historical Censuses from their childhood families in 1920 into adulthood in 1940, and find that children with less foreign names completed more years of schooling, earned more and were less likely to be unemployed. Children with less foreign names were also less likely to marry a spouse who was born abroad or who had a very foreign name herself. The associations between name foreignness and outcomes are still sizeable when we compare brothers raised in the same household, even brothers who were born within two years of each other and thus grew up with parents who had similar levels of cultural and financial resources. This pattern suggests that a portion of the association between name foreignness and social and economic outcomes is not driven by the selection of households that choose to use foreign names. Having a foreign name could influence an individual’s behaviour through his own perceived identity or through the experience of discrimination in school or on the job. Contrary to Senator Lodge’s fears, immigrants appear to have rapidly assimilated during the Age of Mass Migration. Despite arriving with a distinct set of cultural practices (proxied here by name choices), immigrants closed half of their cultural gap with natives after 20 years in the US. By 1930, more than two-thirds of immigrants had applied for US citizenship and almost all reported some ability to speak English. A third of first-generation immigrants who arrived in the US before marrying and more than half of second-generation immigrants married spouses from different origins. Yet immigrants did not completely adopt the practices of US natives within a generation. Despite the fact that children with less foreign names earned more, some immigrant parents still chose to endow their children with culturally specific names, highlighting the value that some immigrants placed on maintaining their cultural identity.8 Given that it takes time for immigrants to adapt to US culture and that immigrants place some value on maintaining their cultural identity, there will always be an opportunity for anti-immigration politicians to criticize immigrants for their distinctiveness. Abramitzky, R., L. Boustan, and K. Eriksson (2016), “Cultural assimilation during the age of mass migration,” working paper. Akerlof, George A. and Rachel E. Kranton (2000), “Economics and Identity.” Quarterly Journal of Economics, 715-53. Algan, Y., T. Mayer, and M. Thoenig (2013), “The Economic Incentives of Cultural Transmission: Spatial Evidence from Naming Patterns across France.” Manuscript. Bisin, A. and T. Verdier (2000), “Beyond the Melting Pot: Cultural Transmission, Marriage, and the Evolution of Ethnic and Religious Traits.” Quarterly Journal of Economics, 955-988. Citrin, J., D. P. Green, C. Muste, and C. Wong (1997), “Public Opinion Toward Immigration Reform: The Role of Economic Motivations.” Journal of Politics 59(3), 858-881. DelReal, J. A. (2016), “Trump Claims Assimilation among American Muslims Is Close to Non Existent.” Washington Post, June 15. Fryer, R. G., and S. Levitt (2004), “The Causes and Consequences of Distinctively Black Names.” Quarterly Journal of Economics 119(3), 767-805. Gerhards, J., and S. Hans (2009), “From Hasan to Herbert: Name‐Giving Patterns of Immigrant Parents between Acculturation and Ethnic Maintenance.” American Journal of Sociology 114(4), 1102-1128. Goldin, C. (1994), “The Political Economy of Immigration Restriction in the United States, 1890 to 1921.” In The Regulated Economy: A Historical Approach to Political Economy, pp. 223-258. University of Chicago Press. Hainmueller, J., and M. J. Hiscox (2010), “Attitudes toward Highly Skilled and Low-skilled Immigration: Evidence from a Survey Experiment.” American Political Science Review 104(1), 61-84. Johnson, J. (2015), “Trump Calls for ‘Total and Complete Shutdown of Muslims Entering the United States’.” Washington Post, December 7. King, D. (2009), Making Americans: Immigration, Race, and the Origins of the Diverse Democracy. Harvard University Press. Lieberson, S. (2000), A Matter of Taste: How Names, Fashion, and Culture Change. New Haven: Yale University Press. Rucker, P., J. A. DelReal and I. Stanley-Becker (2016), “Trump Pushes Expanded Ban on Muslims Entering the U.S.” Washington Post, June 13. Sue, C. A., and E. E. Telles (2007), “Assimilation and Gender in Naming.” American Journal of Sociology 112(5), 1383-1415. Congress passed a literacy test for entry to the US in 1917 and a set of country-specific quotas that favored northern and western European countries in 1921 (modified in 1924). Goldin (1994) reviews the political economy of this legislation. Lieberson (2000) is the classic reference in sociology on how naming reflects cultural context. On African-American naming practices, see Fryer and Levitt (2004); on Hispanics, see Sue and Telles (2007); and on immigrants to Europe, see Algan et al. (2013) and Gerhards and Hans (2009). In contrast, inter-marriage requires finding a willing spouse and moving into an integrated neighborhood often requires financial capital. Fryer and Levitt (2004) used a similar index in their study of distinctively black names. The value placed on maintaining ethnic identity is consistent with Akerlof and Kranton’s (2000) theory of the economics of identity and Bisin and Verdier’s (2000) model of cultural transmission within families.